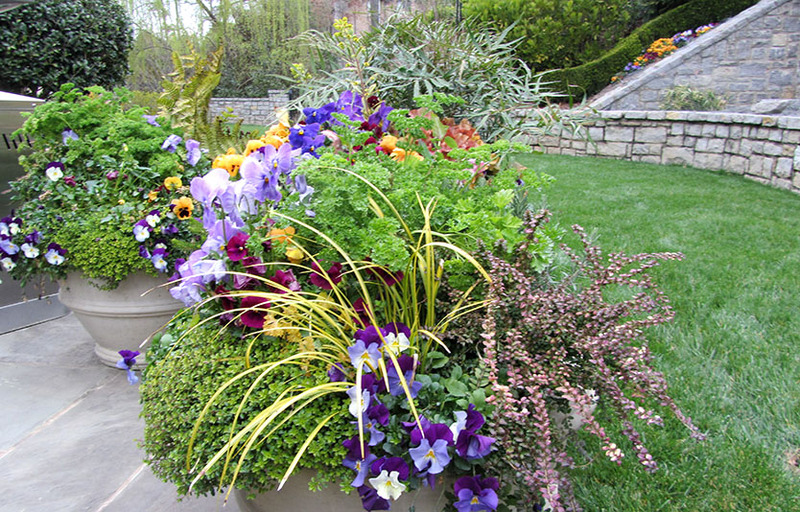 This homeowner was exhausted of seeing the “same ole, same ole” in her container garden. 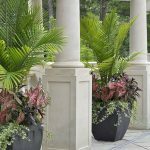 She wanted something more than the ordinary fern in the center with flowers surrounding it; she was looking for containers that were innovative, exciting and creative. With this thought-provoking challenge, we were beyond excited to have a client that would allow us to explore our creativity. 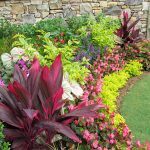 One of the best ways to create interest is to juxtapose the spike of the Cordyline Red Sensation with the dainty Hip Hop Euphorbia while incorporating the bold foliage of the Red Dragon Wing Begonia. 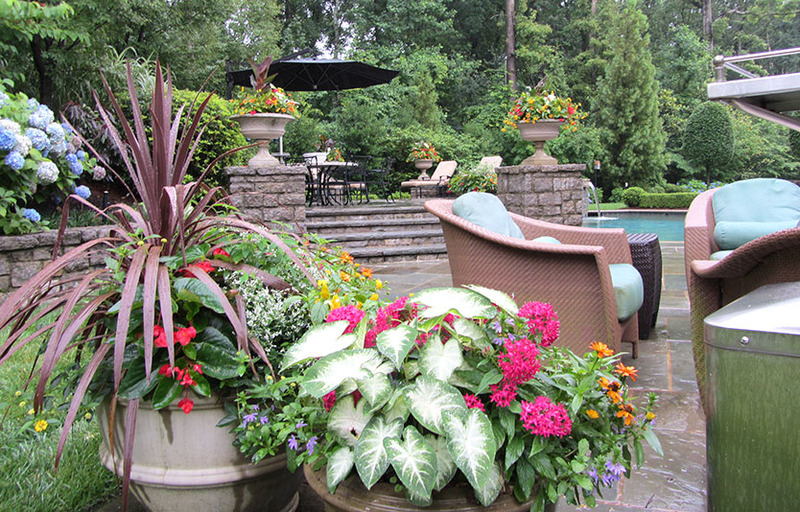 The orange of the Profusion Zinnias, rose of the Graffiti Pentas, yellow of the New Gold Lantana and white of the Aaron Caladium amplifies the significance of the container garden. 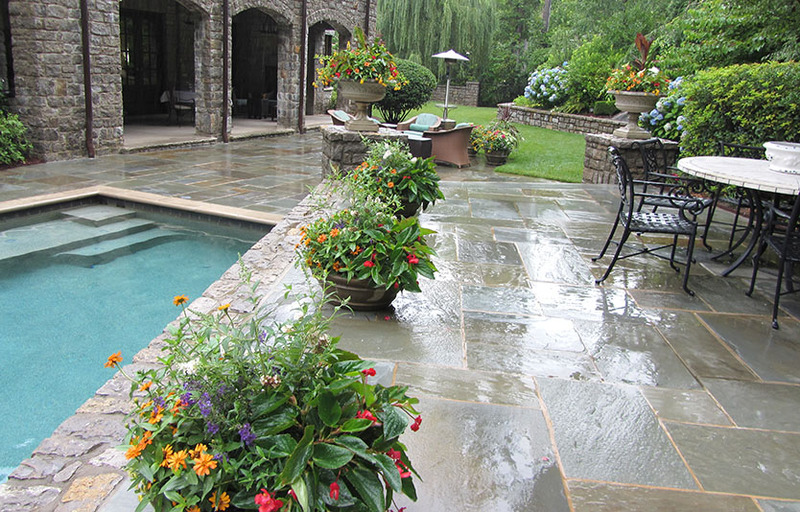 The blue of the scaevola in the container is helping create a repetition of the color since it is so pronounced in the hydrangeas and in the cushions on her lawn furniture. The Orange Zinnia and Red Dragon Wing Begonias and the New Gold Lantana show a bright display of color that lights the pots on fire. With the fall planting, textures were created using the spike of the Acrous Ogon and undefined growth habit of Lonicera Baggensen’s Gold, the more delicate Golden Thyme, and the boldness of the parsley. 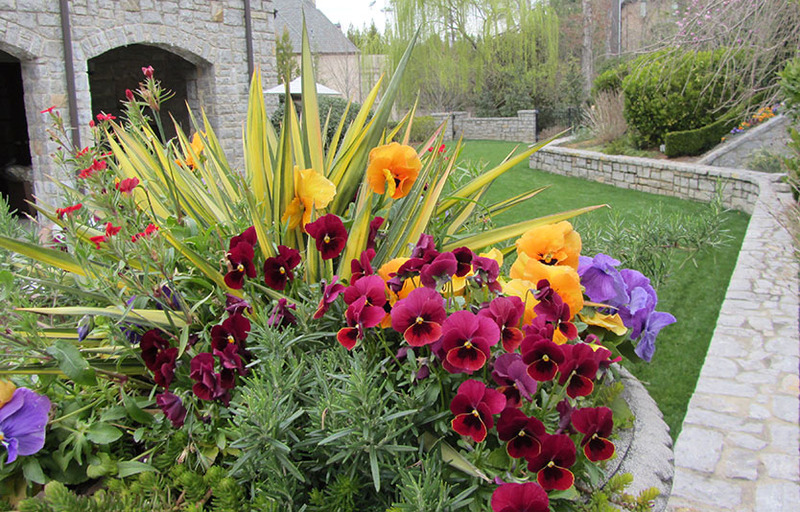 Adding in the Delta Orange Blotch Pansy, Delta Lavender Shades, and Karma Rose Blotch Pansy, along with the Cool Wave Violet Wing Pansy provides the soothing colors that compliment the other foliage plants in the containers. Ultimately, the design created a fascinating container experience throughout the winter. 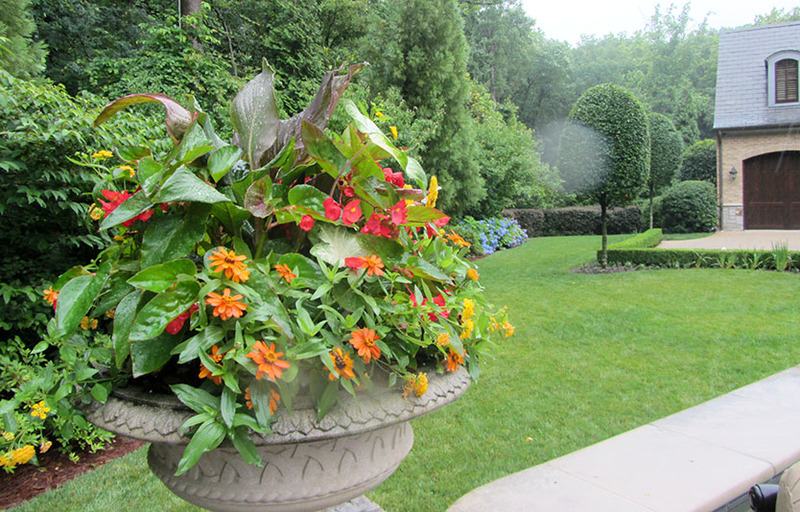 Not only was plant material interest in mind while designing these containers, we also wanted to make sure that the plant material was positioned so that the client could enjoy flowers from her vantage point. Since she rarely viewed the back portion of the container, we strategically placed the height in the back rather than in the traditional center of the pot. 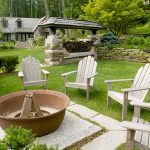 The layering effect worked perfectly, allowing the client to get complete enjoyment all year long. 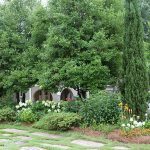 Gibbs Landscape Company offers a proven track record of creative, quality landscape design and maintenance. 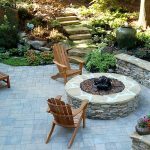 You deserve the best in landscape design/build and maintenance…You deserve Gibbs Landscape Company. 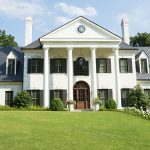 We have earned the reputation of being the market leader in residential and commercial landscaping, and this is largely due to what we have termed “The Gibbs Approach” which includes service, creativity, experience, teamwork, and results.